Structure of the yttrium manganite crystal. The figure shows the atomic unit cell from which the investigated crystals are composed. Manganese atoms (blue) are placed within a cage of oxygen atoms (gray). In between these the yttrium atoms (red) are arranged. The slight tilt of the oxygen cages to the left or right is the basis of the phase transition described in the text. (Phys.org)—Scientists have replaced the telescope with the microscope: Using the similarities between the structure of a crystal and the state of the cosmos in the early universe, they have explored a yet unconfirmed phenomenon, the formation of cosmic strings. These so-called "topological defects" are believed to have formed as the universe expanded shortly after the Big Bang. Studying the formation and early development of the universe is difficult as neither can be recreated in the laboratory. Instead, cosmologists and astrophysicists depend on gigantic telescopes orbiting in space. With these they observe the cosmic microwave radiation, which is a kind of echo of the Big Bang and can reveal important information about early universe processes. But recently materials scientists have entered the field of cosmology and gained new insights using more simple earth-based supercomputers and microscopes. This is the case with Nicola Spaldin, Professor for Materials Theory and Manfred Fiebig, Professor for Multifunctional Ferroic Materials at the ETHZ. Spaldin and Fiebig, together with their research groups, have tackled a fundamental question of cosmology using a small crystal of a material called yttrium manganite. The crystal first attracted the researchers' attention because of its so-called multiferroic behavior, in which the electric charges and magnetic dipoles arrange themselves spontaneously. The scientists discovered that, very surprisingly, the spontaneous arrangement of the electric charges follows the same rules that describe the universe during its early expansion – in fact at the time when the universe split into matter and the forces keeping it together. Regions with different orientation of the electric charges in yttrium manganite (white and black areas correspond to a positiver and negative charge distribution, respectively). The star-shaped intersections where bright and dark regions meet are the defects corresponding to the cosmic strings. During the first fraction of a second after the Big Bang, the universe is thought to have experienced a phase transition, in which its state – in particular its symmetry – changed fundamentally. According to cosmology theory this led to the emergence of defects, called cosmic strings (see also), in the otherwise uniform structure of the universe. Cosmic strings have not been observed to date, but a basic law has been developed by physicists Thomas Kibble and Wojciech Zurek to predict how many of them should form under certain conditions. Verification of this "Kibble-Zurek" law is a long sought-after goal, as it would clarify our understanding of the formation of the universe. The ETH researchers claim the first ever verification of the Kibble-Zurek law for the formation of cosmic strings by exploiting parallels between the symmetry properties of the early universe and their yttrium manganite crystals. "The underlying physical models are applicable to all phase transitions of the same symmetry type", says Spaldin. 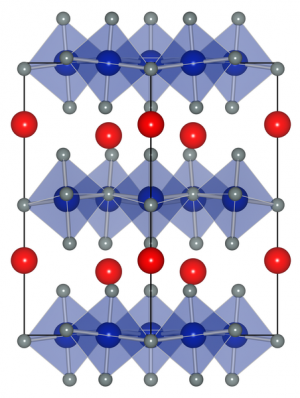 So once the researchers had shown that yttrium manganite has the same symmetry properties as the early universe, they could calculate the density of defects expected from the Kibble-Zurek law using the CSCS supercomputer "Monte Rosa". Then they induced the crystallographic phase transition in the laboratory by cooling the crystal, and tested the Kibble-Zurek law by counting the number of defects that formed in the crystal lattice using an atomic force microscope. "The abstract cosmic strings correspond to starlike crossing points in the crystal structure – one can simply count them", Martin Lilienblum, a PhD student in Fiebig's group, happily says. The researchers found that the number of defects formed experimentally is consistent with the number predicted using the Kibble-Zurek law. "Now that we've demonstrated the validity of the Kibble-Zurek law in yttrium manganite, we can go on to investigate alternative scenarios for the time after the Big Bang", explains Sinéad Griffin, PhD student in Spaldin's group, excitedly "like the possibility suspected by some scientists that the universe expanded much faster than generally believed." Many other research teams had previously attempted to verify the Kibble-Zurek law in a wide range of systems. "It took a combination of detailed materials theory, crystal analysis, and a lot of luck, that allowed us to succeed with yttrium manganite", Spaldin and Fiebig say. "It is fantastic that we are all working in the same department at the ETH Zurich", where they continue their research on "cosmology under the microscope." More information: Griffin, SM et al. Scaling behavior and beyond equilibrium in the hexagonal manganites, Physical Review X 2, 041022 (2012) DOI: 10.1103/PhysRevX.2.041022. The problem is that inflation rules out many of these defects ( including the here observed domain walls; http://en.wikiped...l_defect ), GUT theories with their state transitions are ruled out by LHC, and the Standard Model state transition to a free quark-gluon plasma turned out to be something else (a perfect liquid). So I dunno. But for the distribution of high redshift sky objects, cosmos isn't homogeneous. From about 60 high z quasars/galaxies (z>5), there are 17 at around Ursa Major & Leo constellations. This is too concentrated for any certain territory, unless that territory is really special in the Universe. There are only about 22 out of 60 detected at other side of galactic map of Ursa Major & Leo. So, the Big Bang theory still remains a theory, not more than theory. And please enjoy that theory. These so-called "topological defects" are believed to have formed as the universe expanded shortly after the Big Bang. It implies, whole the Universe is massive body, or not? Studying the formation and early development of the universe is difficult as neither can be recreated in the laboratory. Instead, cosmologists and astrophysicists depend on gigantic telescopes orbiting in space. With these they observe the cosmic microwave radiation, which is a kind of echo of the Big Bang and can reveal important information about early universe processes…. Conventionally the cosmic microwave radiation (which explained as the relic of the inflation period under the big bang universe model) seems to make sense; anyway it comes with the crucial problem of infinite amount of energy which does not know where it comes from! Maybe this alternative view could solve the problem. No it does not. Whatever gave you that idea? "The magnetic force microscope (MFM) is a variety of atomic force microscope"
that is one freaky picture. The most freaky thing to me is that all junctions are triple junctions (3 light and 3 dark areas meeting). Never 2, and never 4 or more (though there are 2 places I can see where two closeby junctions almost give the impression of a 4-junction). Science needs to be specific about identification that helps advancement. Source will have the Flows. the flows spread in 4-mode.I have simple mirror that shows a diamond mode -4 cornered flows from any source. Then one has to for Fields and Flow-Fields Interface.ANO-RANEEYAN MAHATO MAHEEYAN- From Atomic Levels to Heart of Universe- the Reflector Modes can be decipphered in stages- origins- Cosmology Vedas Interlinks. BIg-Bang dogma does not answer or attend to the Issues. Where does Science stand through Nature and Philosophy ? Not in the usual sense, the temperatures were so high that even neutrons and protons could not exist, never mind atoms. It only uses the material as a physical analogy, the symmetries involved are believed to be the same so the math should be the same. There are many examples of similar math applying to different physical systems. That is incorrect, inflation was complete at around 10^-32 seconds, the CMBR was released 378 thousand years later. anyway it comes with the crucial problem of infinite amount of energy which does not know where it comes from! Wrong again, the negative gravitational potential energy means that the total energy was zero in the conventional model. Maybe this alternative view could solve the problem. Perhaps you should study the subject a bit more before trying to solve problems that don't exist, you could save yourself a lot of wasted effort. Faces are apparent everywhere because your brain is designed to pick out face-like shapes from its visual input, in a similar manner to how it picks out edges and continuities. Your brain is also designed to ascribe "personalities" to the objects it picks out, which is why some of those apparent faces look happy, or sad, or angry, or thoughtful. the negative gravitational potential energy means that the total energy was zero in the conventional model. Exactly. The really interesting question is: why did the symmetry break (into the energy/gravity dichotomy). Or more precisely: why COULD it break in the first place. If we ever can figure that one out we'll be a good ways further along in understanding the nature of the universe. Why the dense gas condenses into mixture of droplets and less dense gas during its cooling? If you can understand it, you may explain the formation of matter in dense aether model. you may explain the formation of matter in dense aether model. What happens in the rarified aether model? Manhar..you bring up the point of instant combustion...an odd event for sure..i shall spend some time finding what i can on the subject.